Eventide offers an academic discount toward the purchase of our award-winning plug-ins. Please fill out the form below and provide identification proving that you are an educator or enrolled as a full-time student. Upon approval, you will receive a coupon code toward your purchase of an Eventide plug-in. All educational purchases require verification. Please allow up to 48 hours. 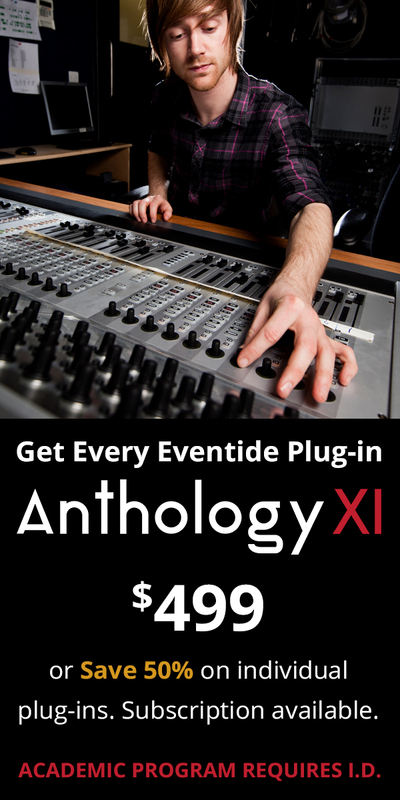 Anthology XI is a complete bundle of every Eventide plug-in based on over 45 years of Eventide iconic studio gear. The bundle includes 23 plugins. Name must match your student/faculty ID. Name of college or university. Upload a scan or picture of your student/faculty ID. File types allowed: gif, png and jpg. Max file size: 2mb.